I’d like to join but I’m too old. They’re a lot nicer looking than Taiwan’s! What do you mean, join the military? I wouldn’t even know where to go. It seems it’s getting harder and harder to be a soldier. How do they get in? What will China’s troops be like in the future? They all get in by giving bribes, they’re all the children of wealthy families. Not bad. Good photos and good topic. But on Guangzhou streets you see the military vehicles parking crazy, driving crazy. What’s more, which people are they protecting? Are the common people living equitable, fair lives? With the guarantee of the law? Those who are responsible for protecting the people, please love the people! Selected comments, because 90% are still “me too!”s. People (irrespective of nationality) are sheep, I tell ya. yes, you’re totally right. 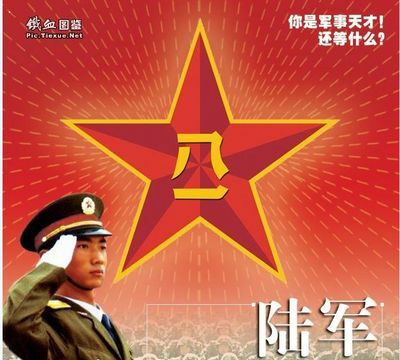 Most commenters love the posters…but I was surprised, actually, at how many posts there were about all the bribes and gifts and personal connections one has to have to get in the army.